4. Recasting of subjects in semesters in view of reintroduction of 6 Months Industrial Training. 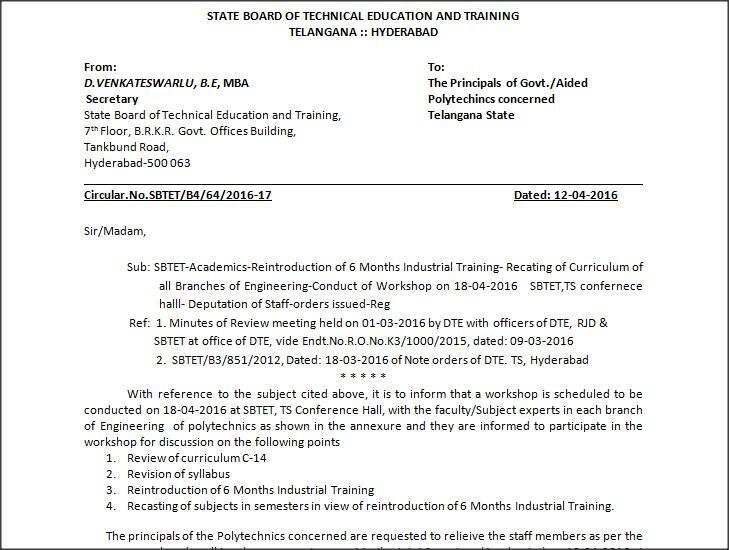 The principals of the Polytechnics concerned are requested to relieive the staff members as per the annexure enclosed, well in advance so as to report to the Joint Secretary (Academics) on 18-04-2016 at 10:30 am at SBTET, TS Conference Hall without fail. The staff members deputed are eligible for TA and DA as per SBTET norms in vogue and their absence will be treated as OD at the institution. Diploma in Applied Electronics & Instrumentation Engg. Diploma in Commercial & Computer Practice.